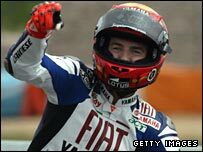 MotoGP world championship leader Jorge Lorenzo has had surgery on his right arm to relieve compartmental syndrome. The procedure loosens muscle compression inside the arm in order to relieve pain and loss of strength. The 20-year-old Yamaha rider had the operation 24 hours after winning the Portuguese Grand Prix and says he will be fit for the next race, in China. "I'll race with one hand if I have to," said Lorenzo, who is joint top of the championship table with Dani Pedrosa. Lorenzo and fellow Spaniard Pedrosa, who rides for Honda, are level on 61 points after three races, with one win each so far this season. Lorenzo, who has been on pole for all three races so far this season, is the youngest rider to make the podium in his first three MotoGP races, and is not expected to get back on a bike for at least two weeks.